This ball of Cascade Jewel is one of my stash's oldest residents. You can see it here, in the second post I ever made on my old knitting blog (please don't ask what happened to those half-finished designs, because I have no idea.) And at that point, it had been in my stash for quite some time. - I moved from Portland to Michigan, to Ohio, to Michigan, back to Portland, and back to Michigan. This yarn has lived with me in 5 houses, 4 apartments, and a dorm room. This yarn has been around the block a bit, quietly languishing as its peers came and went, on to better and brighter things. Over the years I've planned to make it into armwarmers, batwings, earflap hats, but it just never happened. But now, finally, I have called upon it. ...to be an experimental prototype for a project in the book that will be published in a different yarn. Probably a half-finished one since I think there's not quite enough yardage. Sorry bud, we can't all be destined for greatness. oh god, I was just looking at my monster stash today and seeing so many skeins of yarn just.like.this. Stuff that's been there since the beginning, and will probably follow me to the end. Like my own, trusty, fibery Samwise Gamgees. Is that their Magnum yarn? I could easily handspin a copy of it. 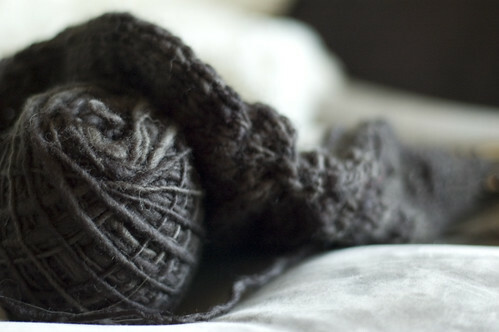 Are you featuring handspun at all in your book? Yeah, sometimes it happens that yarns you thought were great, turn out to not quite be what you thought they were. I have the same problem sometimes. The sad part is that it's a perfectly decent yarn, it just... was never as interesting as something else I could use for a given project, haha. At the very least, it's got a great blog post written in its honour. I feel a bit inspired to dig to the bottom of my stash and make useful the otherwise very old and languishing skeins of randomness.